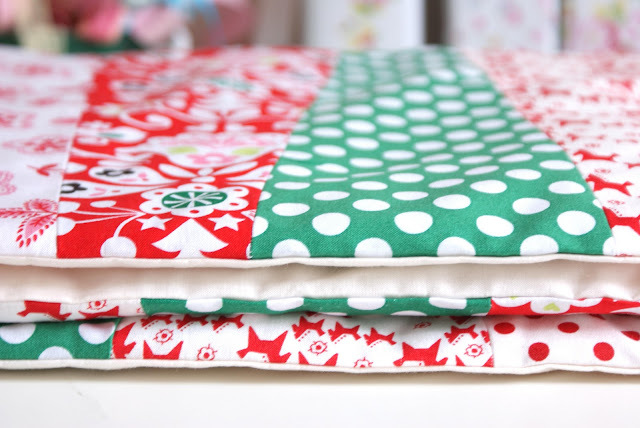 MessyJesse - a quilt blog by Jessie Fincham: Quilted Christmas Table Runner Tutorial! Quilted Christmas Table Runner Tutorial! Hi friends! I thought you might like to see my quilted christmas table runner I made over the weekend. Since all my Christmas decorations are at home with my parents this year I needed to spruce up our little flat with some bright and festive fun, so this is what I came up with. I took some pictures along the way so you can hopefully follow and make one yourself? Firstly, you need to cut this shape out of paper to use as a template. Mine measured 5" along the bottom, 15" on the long and 2.5" across the top. You then need to cut 4 shapes out of each of your 5 fabric designs. Pin one end of your first shape to the opposite end of your next shape (so they are top and tail). Stitch, then continue this with an additional shape, and so on until you have all your strips joined together. Press open all your seams. Cut out a peice of backing fabric to match the same size as your top layer. Lay this flat on top and pin. Stitch together, leaving a gap of about 8" to turn inside out. Cut a layer of thin wadding to fill the runner, then make a small slipstitch to close up the open edge. this is great - thanks for the tutorial, I'll be saving this for even after the holidays are over!